In the last decade there has been growing international concern about the increasing numbers of women in prison, the effects that imprisonment has on their children, the realisation that gaoled women have different criminal profiles and rehabilitative needs to male prisoners, and the seeming intractability of the associated problems. 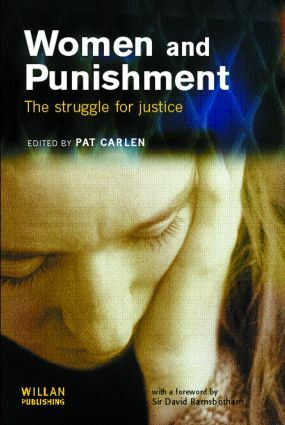 In response there has been an overarching policy concern in many countries to fashion and co-ordinate gender-specific policies towards female offenders which aim both to slow down the rate of their offending and/or imprisonment, and also to engender flexible programmes which will reduce the time spent in custody and/or away from their young children. The major objective of this book is to describe and analyse contemporary opportunities for, and barriers to, both the reduction of female prison populations and the reduction of the pain of those women who continue to be imprisoned. It assesses the most important recent attempts to reduce both women's imprisonment and the damage it does, identifying and analyzing cross-jurisdiction and gender-specific lessons to be learned, and the unexpected consequences of some of the reform strategies. This book brings together leading scholars and practitioners in the field, providing a critique of the reform initiatives which have taken place, and a much-needed theorization of cross-national policy in this area. It will be essential reading for all with an interest in prisons and prison reform.